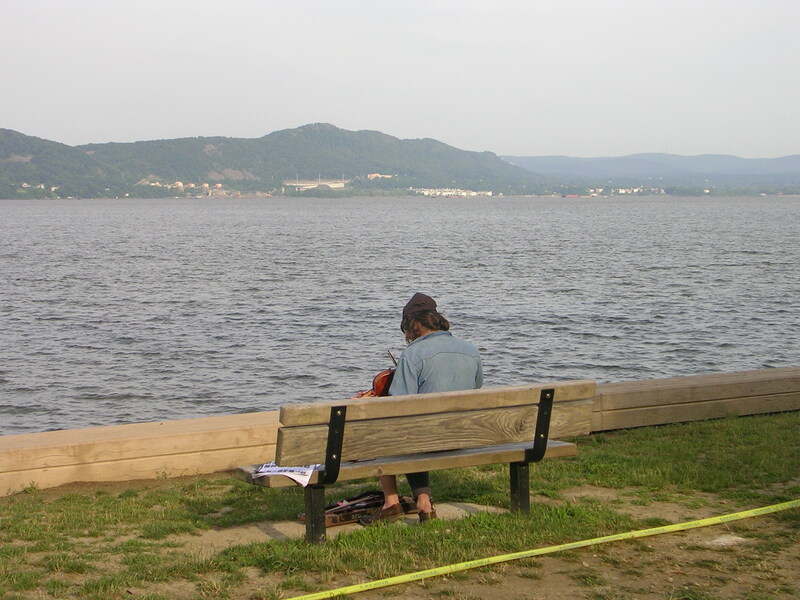 A fiddler enjoys sunrise along the Hudson River at Clearwater 2011. One of my favorite cause buttons carries a simple message: “The best things in life aren’t things.” A fixture of my life these days is non-commercial radio and television, where I now get much of my news, entertainment and creative inspiration. My apologies to the Daily News, the Times and CNN. I still scan the metro dailies and a progressive online newsletter frequently, but there is so much junk to wade through. When I want a high-quality media product, I find myself turning, more and more, to National Public Radio, PBS, and, most of all, to the superb non-commercial “rock and roots” radio station at Fordham, the Jesuit University in New York, which broadcasts on the 90.7 FM frequency. Since I moved to the city a little over 30 years ago, the station has been in and out of my life. When I was a Fordham law student living in Astoria in the early 1980’s, the signal (broadcast from the Rose Hill campus of Fordham in the Bronx) came in loud and clear, so I started listening then. When I moved to Brooklyn and later, into Manhattan, it was not so easy to get the transmission, so at some point, I gave up. 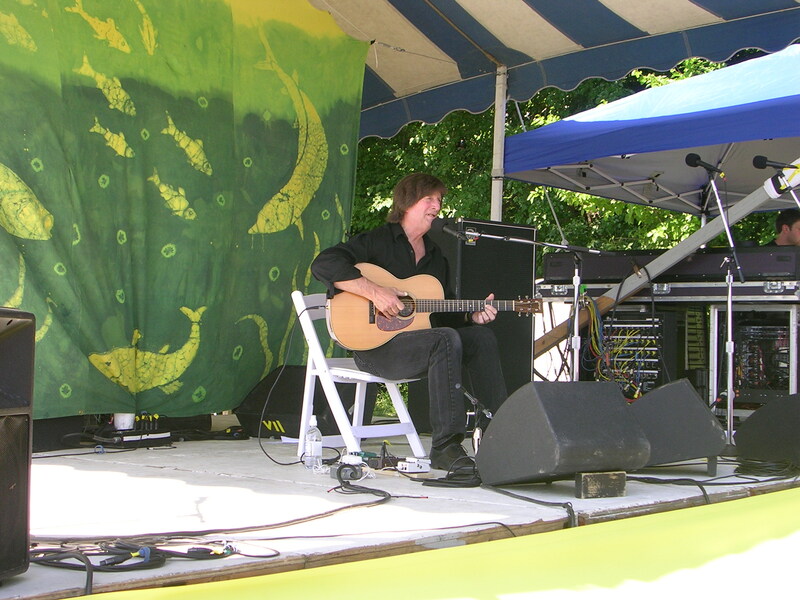 Father's Day 2011--Chris Smither's simple acoustic tune "I Don't Know" ponders the mysteries of fatherhood. The next time I remember tuning in regularly was in the late 1990’s, when I had moved to Belle Harbor, and local fans of traditional Irish music (a WFUV weekend feature) told me the signal was now reaching the peninsula much better. Streaming of radio transmissions over the web had started by then, and I could also get the signal for a portion of my auto commute to Suffolk County. I recall becoming a Lucy Kaplansky fan in 2002, and being moved by her poignant song “Land of the Living,” written in the aftermath of the events of 9/11/01. 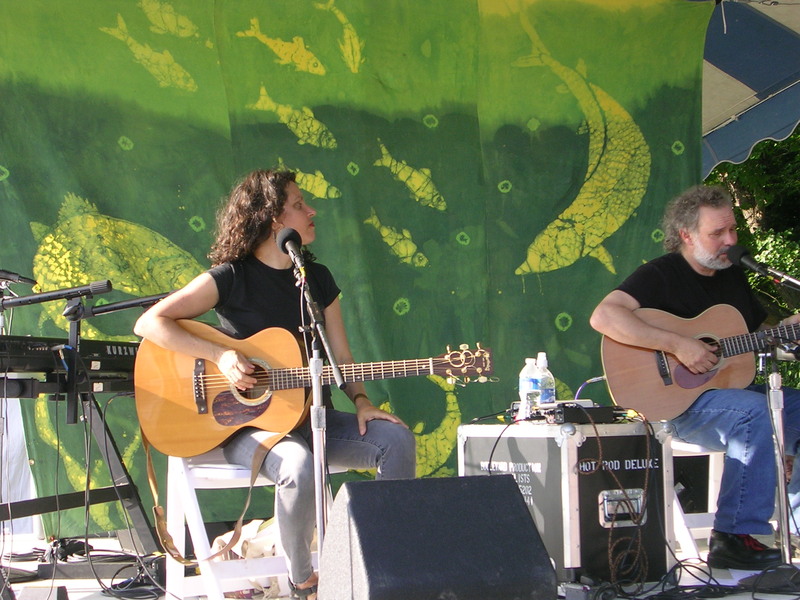 The beautiful and talented Lucy Kaplansky with John Gorka at Clearwater 2011. But as I got busier with my children’s active lives, volunteer community activities, commuting to part-time jobs by subway, and later teaching in the city schools, WFUV dropped out of my life again. In 2009 and 2010, the station came back within earshot, when I was regularly visiting Patrick Clark’s Sunlites Stained Glass studio in Rockaway Park. I had read in The Wave that longtime WFUV disc jockey Pete Fornatale lives in Belle Harbor, and he came to the Rockaway Artists’ Alliance gallery to do a presentation in 2010. Pete even makes occasional shout-outs on his show to people and businesses in Rockaway. I made an even stronger connection with WFUV after I attended the Clearwater Festival for the first time in 2010. Hearing and seeing many of the artists up close, in person, made me care even more about their music. I’m featuring photos of several long-time WFUV-featured artists taken at the 2011 festival here in this post. Lately, I have become repulsed by the excessive advertisements that dominate commercial radio and television stations. These stations have become more and more formulaic, to the point that they repeat the music of about 50 artists so persistently that I can’t bear to hear music that I used to love. In my opinion, classic rock has been way oversold to the Guitar Hero generation. Non-commercial stations like WFUV have given a start to numerous talented performers like the now-famous Adele, who could not get onto the airwaves a few years ago. She was gracious enough to thank her friends in public radio when she took home a boatload of Grammy Awards this past Sunday. 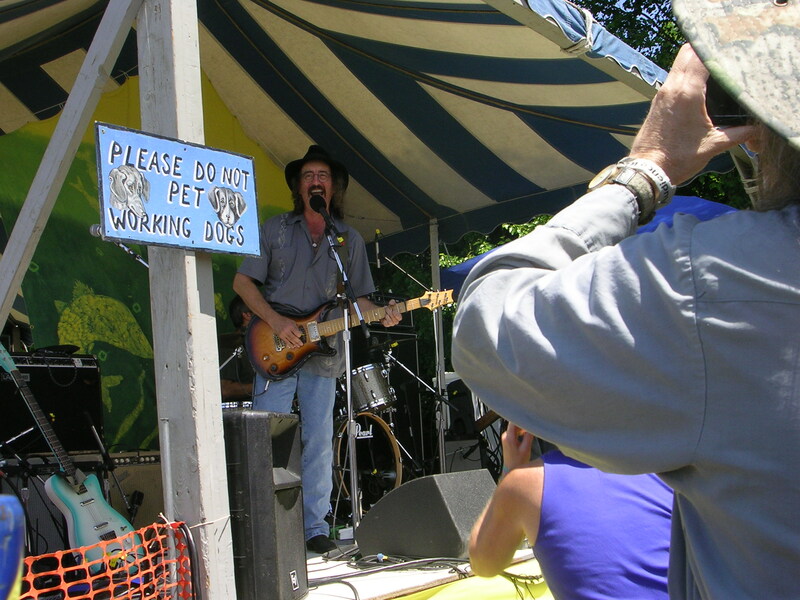 James McMurtry, called the truest, fiercest songwriter of his generation, by Entertainment Weekly. The lyrics of the artists featured on WFUV are touching and intelligent, and the arrangements are not electronically over-produced. If you are sick of what’s out there in the mainstream, you might give WFUV a try. 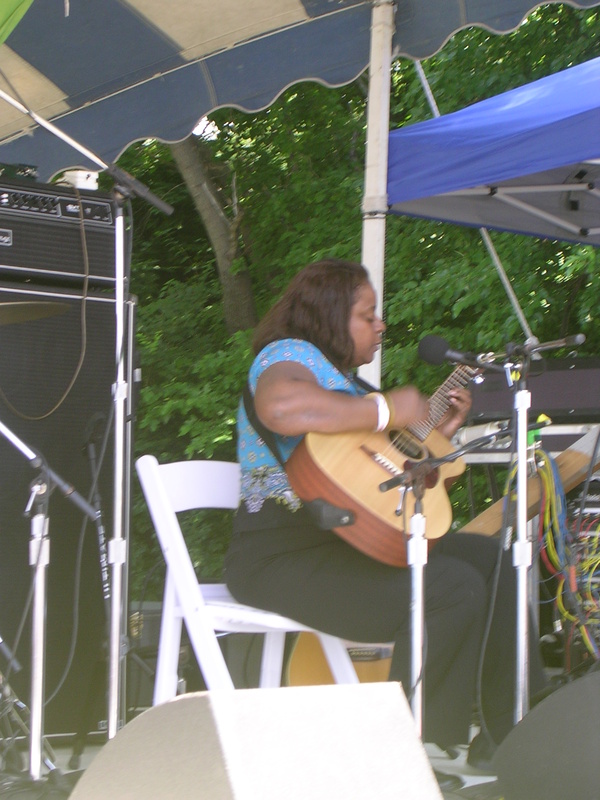 I’m an early riser, so I love to listen to Mountain Stage on Sunday morning from 6-8 a.m., followed by the Sunday Breakfast with Jon Platt (photo of Platt introducing the legendary Janis Ian at the Clearwater Festival is in the header for this post.) I often tune in to Mixed Bag with Pete Fornatale on Saturday evening from 4-8 p.m. Pete’s show on Saturday, December 24, 2011 included such an awesome selection of music that I almost skipped going to Christmas Eve service. It was that good. Claudia Marshall, Corny O’Connell, you name the DJ, and they really know how to choose great music. WFUV is member-supported, just like PBS Station Channel 13. Unfortunately, Channel 13 has given fundraising for non-commercial broadcasting a bad name, at times, with pestering repetitive phone calls and lavish, highly-public, expenditures on overhead. Sometimes, PBS can be a bit preachy, but their educational and cultural programs are clearly the only game in town, as far as I’m concerned. WFUV strikes me as a much more modest operation that deserves the support of music fans. If you like what they do, they have great membership benefits to offer, as well. You can check out their schedule online at wfuv.org, or tune in anytime to 90.7 FM. You may not like everything you hear, but you can be assured of hearing something that isn’t played anywhere else on the dial. Article copyright 2012, photos copyright 2011, Vivian R. Carter. This entry was posted in Meet Your Fellow Man, The Arts and Entertainment, The World of Human Beings and tagged Hudson River Sloop Clearwater, music, Pete Fornatale, The Arts, WFUV. Bookmark the permalink. WFUV rocks. I have been listening to this station since childhood in the 80s. My parents introducedmy siblings &vomiting I to the Irish program one’s WFUV. This got us listening to a genre of music we might not otherwise have heard. From there I have become addicted to many of the other great programs on WFUV with tons of great tunes. Public programming needs the support of the public. So listen and if u like then donate. WFUV runs membership drives throughout the year. Membership comes with benefits. So listenu to 90.7 WFUV & Join soon!!! Good to hear from you again, Kate! I’m glad the younger generation is supporting the station. We have to get Pete Fornatale to come for a live broadcast here in Rockaway. Hope to see you at a participatory budget voting session.